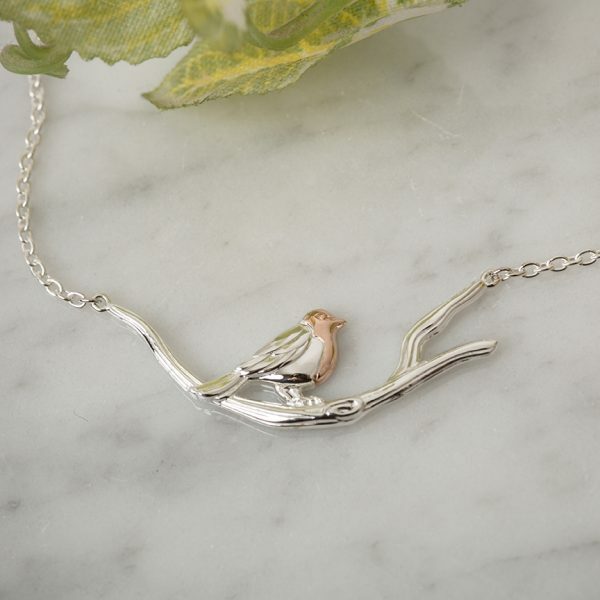 Sterling silver necklace featuring the gorgeous Robin perched on a branch. 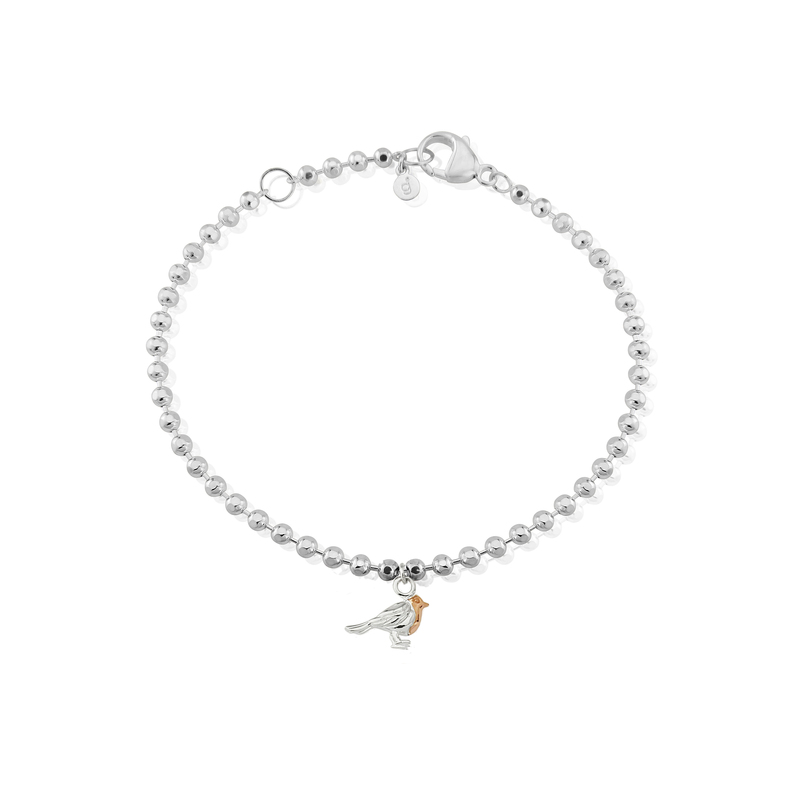 The Robin has long been Britain’s favourite bird and is loved throughout the year and especially at Christmas! Crafted from solid silver with the addition of 14ct rose gold vermeil. Adjustable silver chain length 40 -46 cm. We are pleased to offer FREE delivery on all orders of £50 or over (UK deliveries only).Postage and packing up to £50 is charged at £3.50.All orders are sent 1st class recorded delivery so will need a signature upon receipt. We aim to send all orders out within 24 hours, so you should receive your jewellery within 48 hours.Unfortunately we cannot offer Recorded Delivery to postcodes beginning with GY, HS2, IM, JE, KW16-KW17, PA61-PA75, PA78, PH30, PH41-PH44 and ZE2-ZE3. Customers from Europe and Northern America will be charged £8.50 postage and packing. Goods will be sent airmail recorded delivery and please allow up to 10 days for delivery. If you are not entirely delighted with the goods you have chosen, please ensure you return them to us unused within seven days. We will be more than happy to provide a refund or you can exchange them for alternative products. Please keep all the packaging materials and return the goods as they were sent to you. Please note that we cannot refund or exchange goods in our sale. Items returned to us that arrive damaged or lost will not be credited. The delivery charge on the original order will not be refunded. Goods damaged in transit to you will be replaced at no cost with free delivery. Please inform us of any breakage within three days of receiving the order. For reasons of hygiene we cannot refund or exchange any earrings. Pack the unsuitable items back in their original packaging. Include a completed returns note explaining the reason for the return and details of exchange item if needed. Place the FREEPOST label to the front of the package and don't forget to remove the previously used Royal Mail Recorded/Special delivery label from the front of the parcel. The Robin has long been Britain's favourite bird and is loved throughout the year and especially at Christmas! 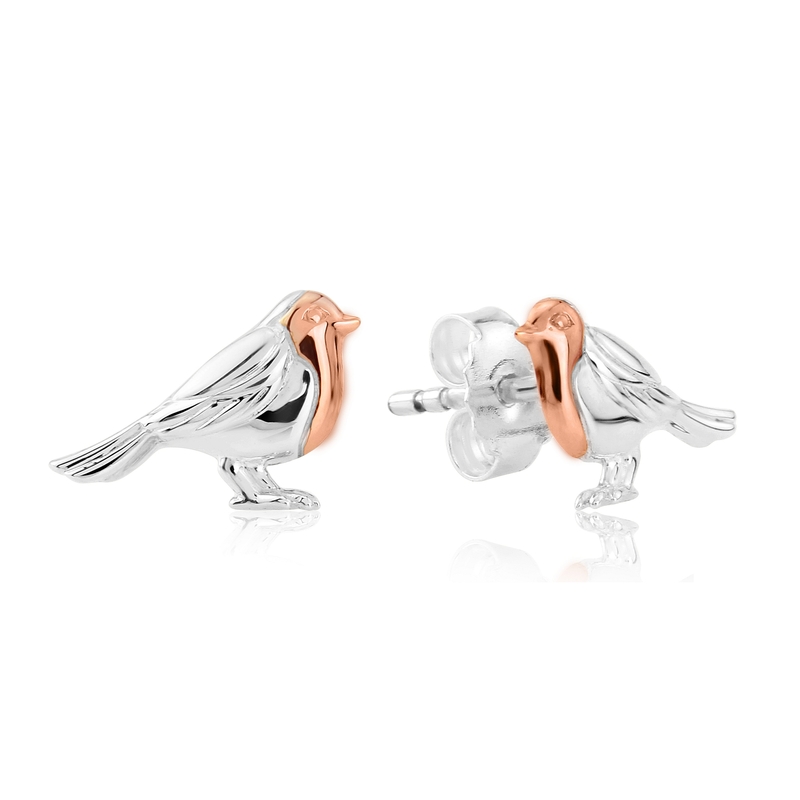 These cute Robin studs are crafted from solid silver with the addition of 14ct rose gold vermeil. Size 8mm x 12mm. Beaded Robin Bracelet Silver beaded bracelet with light catching faceted beads and centered with a cute rose gold breasted Robin. Adjustable length of 18-20cm. 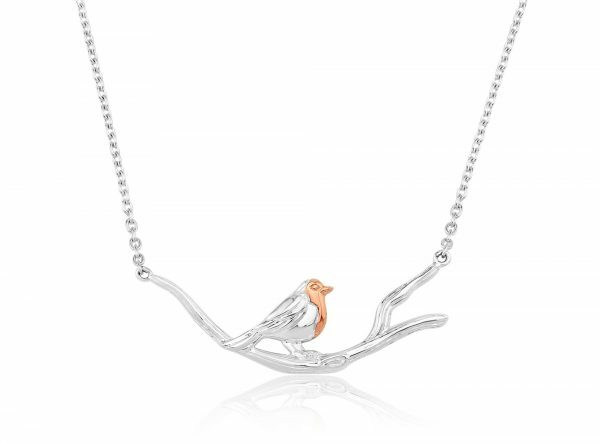 Sterling silver and 14ct rose gold vermeil. The Robin has long been Britain's favourite bird and is loved throughout the year and especially at Christmas. 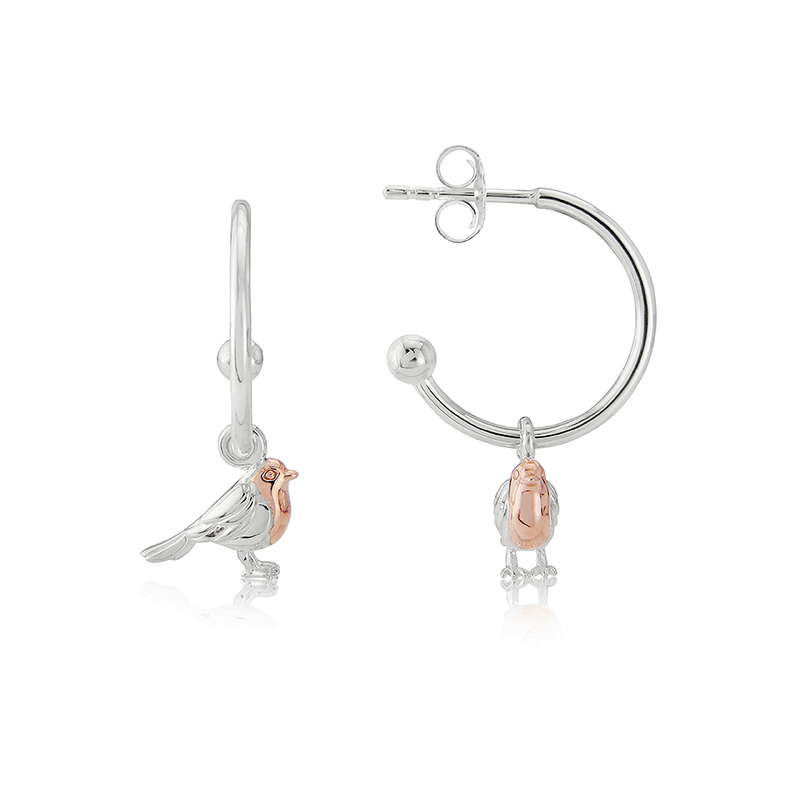 These Robin Hoops are sterling silver with the addition of rose gold on the little Robins breast. Diameter 15mm.